Paying homage to the father of Kyle Gellis, who served as the catalyst for the Warped founder's interest in cigars, the Don Reynaldo Regalos is a Petite Corona Gorda composed of an aged mixture of Dominican and Nicaraguan filler leaf, a Nicaraguan binder, and a rare Dominican Corojo wrapper, offering flavors of cinnamon, cocoa, caramel, underpinned by notes of cedar and black cherry. Only 100 of these special medium-bodied sticks is rolled daily at the El Titan de Bronze factory in Little Havana, Miami, using traditional Cuban rolling techniques such as a triple cap and entubado bunching. 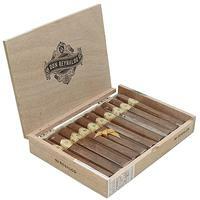 5% Off Five Sticks: $14.44 ea. 10% off box (10): $13.68 ea.